Monitor Audio PL200AV review | What Hi-Fi? If the speakers on show here seem a little familiar, we're not surprised. We've already tested (and loved) several models from the Monitor Audio Platinum series, including the range's flagship offering, the massive PL300 AV surround package. So what gives? Essentially, the new PL200 AV is designed to offer most of the sonic aplomb of the larger and more powerful 5.1 system to a broader audience. 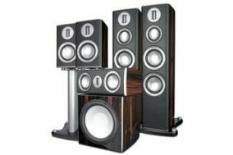 Its front PL200 floorstanders are much smaller than the giant PL300s found in the bigger package and are, as a result, much easier to integrate both acoustically and visually into smaller living rooms. The system's PLC150 centre channel is sized commensurately, so again, it's far easier to fit into many living rooms and equipment stands than its leviathan of a sibling, the PLC350. However, all this talk of downsizing shouldn't underplay the potential of this Monitor Audio package. It might be smaller than the PL300 AV, but that's not to imply that it's in any sense undernourished: quite the reverse is true. You'll still need a quality surround amplifier (or, better, a processor and power amplifier) to truly exploit its sonic potential – not to mention plenty of space. The fact that the PL200s don't actually cost much less than their bigger siblings (£4750 per pair as against £5500) tends to reinforce that point; they've been designed as smaller-scale alternatives to their bigger brothers, not as cut-price economy models. And as such they pack in as much of the all-round ability of the PL300 design as the laws of physics will allow. The big, beautiful PL100 rear speakers – as used in the PL300 AV – are hardly your typical surround speakers, either. Tonally, they're supremely well integrated with the front three speakers, and they're magisterially powerful. But that's no real surprise, as they're hardly shrinking violets. Nor, for that matter, is the monstrous PLW-15 subwoofer, which again is the same design as employed in the larger PL300 AV system. A thousand Watts of power, a 15in C-CAM metal drive unit and a sealed-box enclosure so dense it must have its own gravity: these are the constituent elements of low-end extension that is, in a very physical sense, fundamental. Put the collection together in your living room and you'll have made a considerable dent in your wallet, but at least you'll be left in no doubt as to where the money's gone. The Monitor Audios deftly blend both the tight production tolerances of the best mass-produced kit – there's nary a seam or joint on show – and the bespoke allure of hand-finished construction. Out of the box, they exude reassuring quality, with leather-covered baffles and rich, lustrous, natural-wood veneer finishes. Matching stands for both the PL100s (£400 a pair) and the PLC150 (£300) give the completed ensemble an elegant, cohesive look, and to aid accurate installation, you'll even find a spirit level in the toolbox supplied with each speaker, which certainly adds to the feel-good factor. And their sound is equally pleasurable. It's supremely cohesive, but then you'd expect as much from a system where every speaker employs exactly the same type of tweeter. That virtue is all the more apparent in this case, where each tweeter in the system is an exceptionally articulate ribbon design. That benefits not only clarity and speed: it also aids integration. Voices and subtle effects move from speaker to speaker with exemplary tonal consistency and seemingly absolute accuracy, while the specifics of even the most incoherent phrasing – think Jeff Bridges' mumbled dialogue for Crazy Heart – are laid bare before you. Naturally, it'll play a tune too, stomping merrily through Pearl Jam's blistering cover of Rockin' In The Free World. In fact, it's here that the tauter, leaner sound of the PL200s is most effectively illustrated, with the main speakers following the track's rapid-fire bassline with a shade more agility than their bigger brothers. However, switch to the intensity of the beach assault in Saving Private Ryan and you might, even if only for a second, find yourself pining for the PL300s awe-inspiring, inspirational scale: the PL200s certainly go loud without effort and will readily shake the very fibre of your being with the film's biggest explosions, but even so, there is a price to be paid for their reduced dimensions, however minimal it might be. Of course, that slightly smaller-scale presentation is to be expected: as we said earlier, the PL200s and PLC150 are smaller speakers, and the laws of physics must be obeyed eventually, no matter how clever the design. But in every other regard, Monitor Audio can consider the new PL200 AV system a triumph.